I assume most experienced birders at some time or another have experienced a similar event as to what I am describing here. While out on a bike ride a few days back, one of our group got a flat tire on their bike. As we pulled to the side of the road to fix the flat, I hear this chatter above that sounds very much like a bird of prey. As I look up through the branches of a tall tree, I see two falcon like birds. As my brain shifted into overdriving trying to identify them, I came up blank. They appeared too large to be Kestrels, clearly weren't Peregrines, maybe a Prairie Falcons? They had the head markings of Kestrel, but they were larger and lighter in color. We continued on our ride. The identification bothered me for the whole ride. When I got home, I went straight to the computer to do some research. 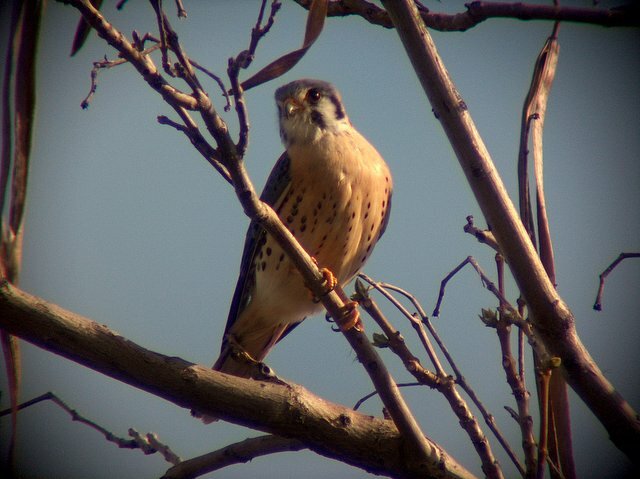 Prairie Falcons do indeed have similar head markings, they are lighter in color, they do exist in our area, ... I just couldn't bring myself to believe that on a somewhat busy street in Boise Idaho, that I would see two prairie falcons in a tree. I have never even seen a Prairie Falcon before. The next day our business was celebrating earth day and had a number of conservation organizations onsite. Representatives from the World Center for Birds of Prey were onsite with a Peregrine Falcon. Amazingly beautiful bird! I asked them about the possibility of my sighting. They too agreed that it was highly unlikely, yet it was possible in our area. That evening, still unconvinced that I actually saw two Prairie Falcons, I returned to the same tree with my spotting scope. Same time of day, same weather, but I knew it was a longshot. Just as I got there the two birds fly in. There they were! 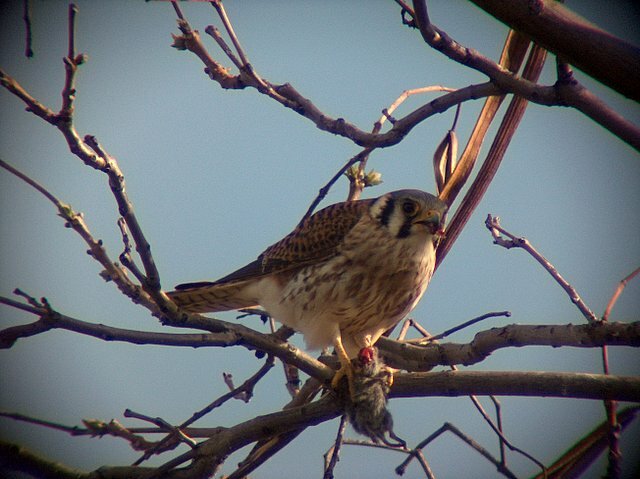 It only took a 1 second look through the binoculars to know that they were two Kestrels. Here is the view through the scope. I had never looked straight up at Kestrels before, always at an angle. The difference in perspective was enough for me to conclude that they were not Kestrels. The good news is that I am now experienced enough to doubt my observation that seemed out of place. This article is featured in I and the Bird #23 blog carnival.